Apparently, the client thought I didn’t use Skype much because I’d failed to respond to a contact request. And he was right – I didn’t. But (though I’m not into playing the blame game, it was totally his fault). Here are two questions his initial contact request didn’t answer. #1. 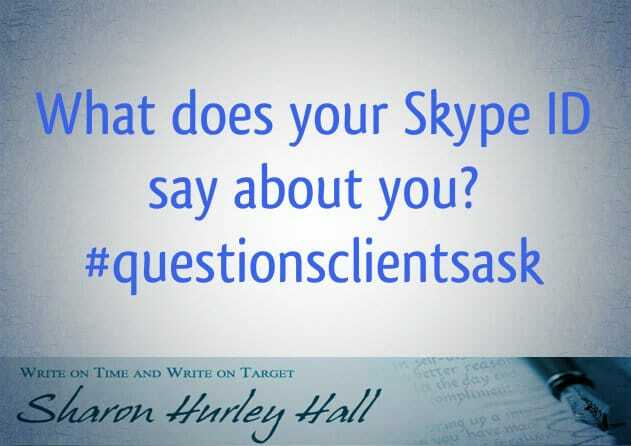 What Does Your Skype ID Say About You? When I got the contact request, I couldn’t tell whether it was from a real person, or someone trawling for Skype users to spam (it happens). The client used his company name as the username and it looked, as Brits say, dodgy. #2. Where’s the Person Behind Your Business? Not wanting to give up, I did some more research. That’s where there was another failure. When I Googled the company and went to the website, I couldn’t identify a person behind the website. That’s why I ignored the contact request. identify yourself as a real person. be clear and specific about the purpose of making contact. There was a happy ending for this client. He made a second request, addressing me by name and providing his name and other information. I accepted the request and we did some work together. The lesson for any business is that people want to do business with real people. Whether on a social media site, a messaging site or a forum, including your name and where people can find you helps to establish those credentials, making it more likely you can work together. Of course, there’s another reason why I’m not always on Skype. If I’m chatting, I’m not writing. The more I write, the better I get and the happier you will be with the final product. However, you can’t deny that Skype is a great tool for connecting with both business contacts and friends. That’s why I’m happy to make appointments for Skype meetings. The rest of the time, I check in to make sure I haven’t missed anything, but basically stay offline. That keeps me both connected – and in control. 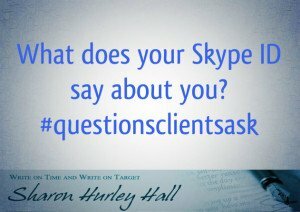 How do you use Skype in your business? Oh yes! Make it easy for folks to contact you and yes, make it clear you’re a human. That’s why my business name and my own name are the same… doesn’t work for everyone. My Skype name is the same, as is my twitter handle. And I too may have missed potential clients because they didn’t make it clear who they were or what they wanted… it’s a shame when that happens because it’s totally avoidable. Tell your client I said so! I try not to use Skype at all. I’ve been working online for a very long time and I most definitely have been scammed. I know that sometimes it can’t be helped, especially if the client is oversees and insists on talking on the phone. However, I much prefer to use the normal telephone. Thanks, Katherine. I see the advantages of a phone, but Skype works well when you work from different locations.